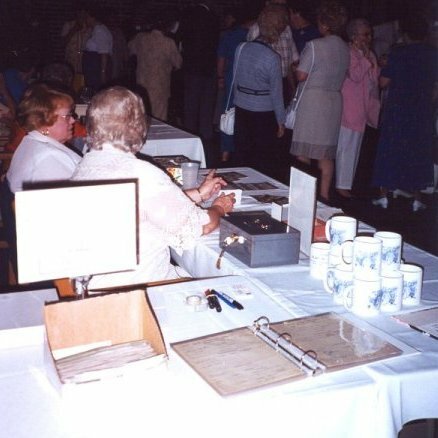 The Ilasco Historical Marker fundraiser table, selling Ilasco coffee mugs (?The Town That Will Not Be Forgotten?) as well as postcards with a special cancellation commemorating the opening of the Ilasco post office in 1903. The angled box in the foreground contains old cancelled paychecks of Atlas Portland Cement employees. (Find one?s family member, and have that check for free!) The binder holds a collection of Atlas ephemera for perusal.